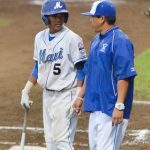 Manufacturing runs proved to be difficult in a pitcher’s duel Wednesday between host Maui High and Pearl City, as the extra-inning battle in the nightcap stayed scoreless for more than 150 minutes of action at the Wally Yonamine Foundation Division I baseball tournament. Finally, in the bottom of the 10th inning — after 2 hours and 34 minutes — Pearl City’s Colby Hirano hit a sinking fly ball that fell just out of the reach of diving left fielder Treston Carter of Maui High, scoring pitcher Trestan Nakamura from third base with two out to give the Chargers a 1-0 win over the Sabers at Maehara Stadium. The Chargers (15-1) advance to today’s quarterfinals against fourth-seeded Waiakea at 1:30 p.m. Meanwhile, Maui Interscholastic League runner-up Maui High will play Kalani in a consolation game Friday at 8:30 a.m.
Second-seeded Baldwin High School will play Waipahu at 7 p.m. tonight in a quarterfinal. The game can be heard live on ESPN Maui 900AM with Barry Helle. Waipahu beat Hilo 7-5 in a first-round game Wednesday. Pearl City starting pitcher Trenton Darley pitched eight scoreless innings, allowing five hits and a walk while striking out five. He had thrown 111 pitched. Nakamura, who started in left field, allowed a hit and a hit batsman in two scoreless innings. Punahou’s Kekoa Vieira throws to first base for a double-play attempt after forcing out Campbell’s Darien Robinson at second base. Photo by Rodney S. Yap. Maui starting pitcher Kyle Oshiro allowed two hits and two walks with two strikeouts in 6 1/3 scoreless innings. He needed help from center fielder Kingsley Ballao, a left-hander who added 2 2/3 scoreless innings, allowing two hits and a walk with three strikeouts. Third baseman Jyran Lalim was the hard-luck losing pitcher. With one out in the bottom of the 10th, Nakamura walked and took second on a wild pitch before Caleb Nishijo walked. Matt Aribal hit a bouncer back to the mound, where Lalim fired to second for the force, but the relay to first was too late for the double play to put runners at the corners. Hirano then lofted a fly to shallow left, but Carter could not come up ball and Nakamura scored the winning run. Among the defensive gems was the play of Maui shortstop Micah Jio, who made some spectacular plays, assisting on six grounders, while displaying his rifle arm. Also, Pearl City center fielder Matt Yokota had six putouts, including a diving catch and another while chasing down a deep fly. Click here for the game’s boxscore. 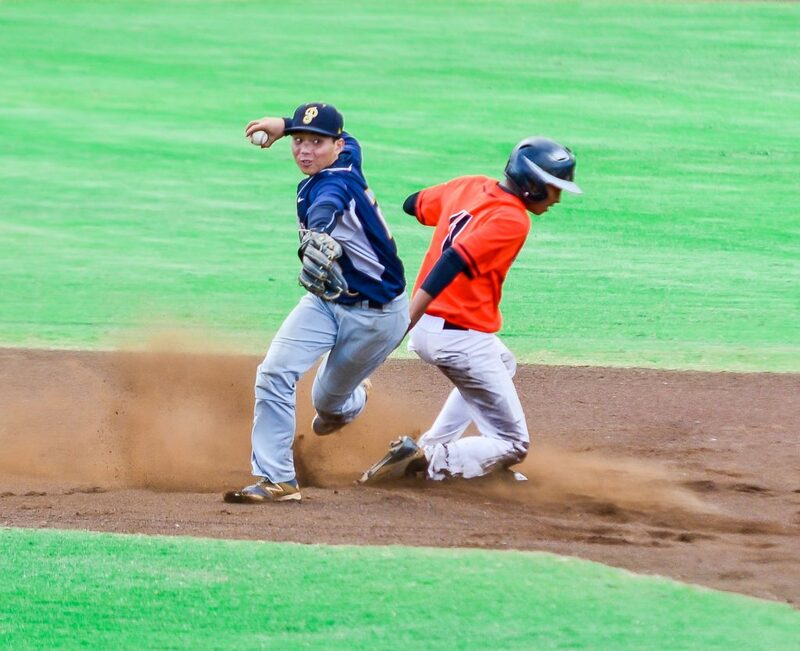 The Sabers’ freshman Ayzek Silva pitched 2 1/3 scoreless innings of relief and Campbell took advantage of three Punahou errors for all its scoring in Wednesday’s opening-round game at the Wally Yonamine Foundation Division I state baseball tournament at Maehara Stadium. The Sabers (11-6) will meet third-seeded Kailua in the 10:45 a.m. quarterfinal today. 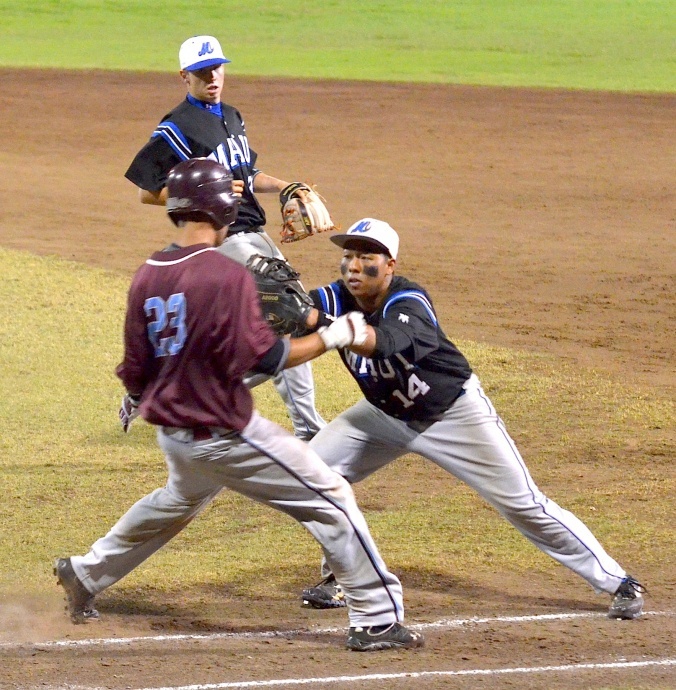 Kailua beat Campbell, 10-3, in the Oahu Interscholastic Association quarterfinals on April 21. 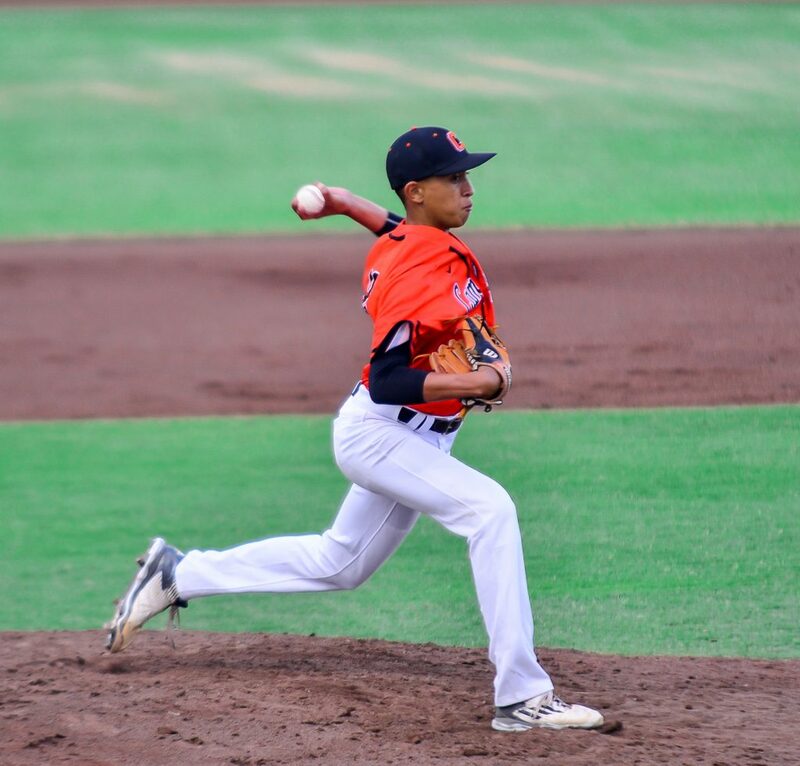 Campbell freshman Ayzek Silva pitched 2 1/3 scoreless innings of relief as the Sabersl cashed in on three Punahou errors for all its scoring in a 3-2 win Wednesday at Maehara Stadium. Photo by Rodney S. Yap. Silva, a 5-foot-11 left-hander, has played big in big games all year, lowering his earned run average to 0.53 in 13 1/3 innings. Silva entered the game for Sampson with runners at first and second with two outs. Silva retired Andrew Matsueda on a grounder to short for a force at second to end the threat. With the game tied at 2, the Sabers scored the go-ahead run in the top of the seventh inning. With runners at first and second with two out, relief pitcher Riley Guieb uncorked a pitch in the dirt that scooted about six feet away from catcher Logan Williams. The runners took off on the pitch in the dirt, Williams retrieved the ball, but his throw to third sailed into left field, allowing Nicholas Sampson to score. Silva picked up the win in relief of starter Sampson, who went 4 2/3 innings, giving up two runs, six hits and two walks with four strikeouts. The Buffanblu trailed 2-0 when they began to catch up with Sampson in the fifth. Asa Kurasaki led off with a double, took third on a wild pitch and an out later, scored on Cole Cabrera’s sacrifice fly to left to pull to 2-1. Goss then signled and scored on Easton Takamoto’s double to left. After DH Noah Loughlin walked, Sampson was pulled for Silva. 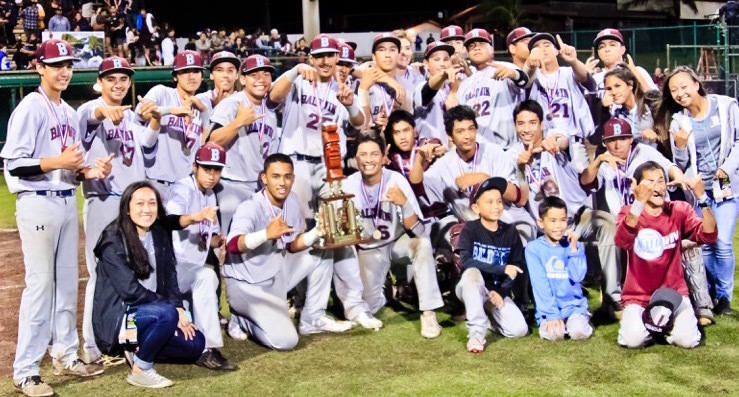 The Trojans’ Justin Ogasawa threw a compete game, allowing a run and five hits, to beat Kalani 7-1 in Wednesday’s opening round of the Wally Yonamine Foundation Division I state baseball tournament at Maehara Stadium. The Trojans (11-5) will play top-seeded Mid-Pacific Institute today at 4:15 p.m. 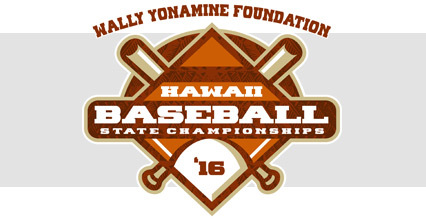 The Falcons (12-4) will play Maui High in Friday’s consolation semifinal at 8:45 a.m.
Mililani scored two runs in the second inning and one in the fourth. Sheldon Lee and Blaine DeMello had RBI singles to help the Trojans build a 2-0. Ryan Kono’s RBI single in the fourth made it 3-0. 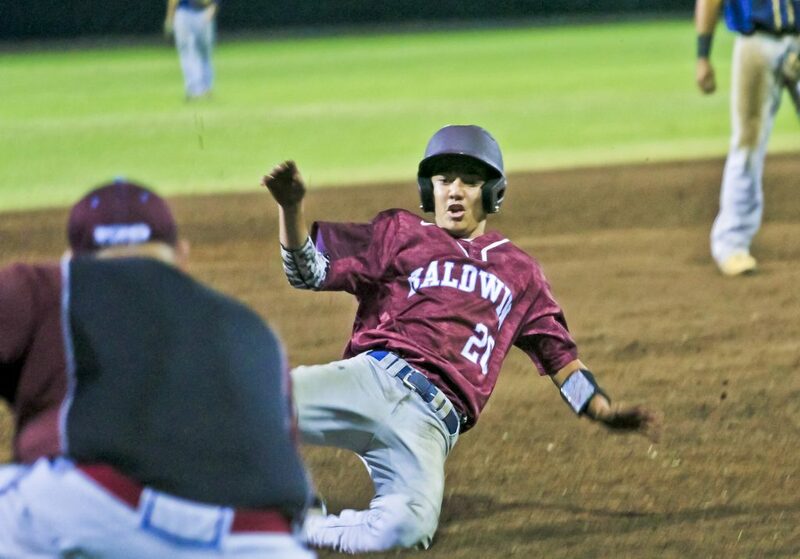 The Falcons scored their only run in the sixth when Reece Kakugawa reached on an RBI fielder’s choice. Their rally was killed by an inning-ending double play, the second of the game behind Ogasawara. The Trojans cushioned their lead with a four-run seventh on RBI doubles from Kaimana Souza-Paaluhi and Nakagawa. Preston Morales had a two-run triple and batted 3 for 3, with two runs. The Muraders starting pitcher Kobie Russell had a complete-game victory as Waipahu defeated Hilo 7-5 in opening-round action Wednesday of the Wally Yonamine Foundation Division I state tournament at Maehara Stadium. The Marauders (6-11) will play second-seeded Baldwin at 7 p.m. tonight in a quarterfinal. The game can be heard live on ESPN Maui 900AM with Barry Helle. Russell allowed five runs (three earned), six hits and five walks with three strikeouts in seven innings. He was backed by a third-inning grand slam by Michael Price. 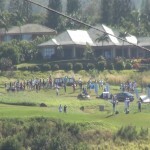 Hilo vs. Punahou, 8:15 a.m.
No. 3 Kailua vs. Campbell, 10:45 a.m.
No. 4 Waiakea vs. Pearl City, 1:30 p.m.
No. 1 Mid-Pacific vs. Mililani, 4:15 p.m.
No. 2 Baldwin vs. Waipahu, 7 p.m.
No. 2 Kauai vs. Radford, 11:30 a.m.
No. 3 Kapolei vs. Konawaena, 2 p.m.
No. 4 Molokai vs. St. Francis, 4:30 p.m.
No. 1 KS Hawaii vs. Kalaheo, 7 p.m.